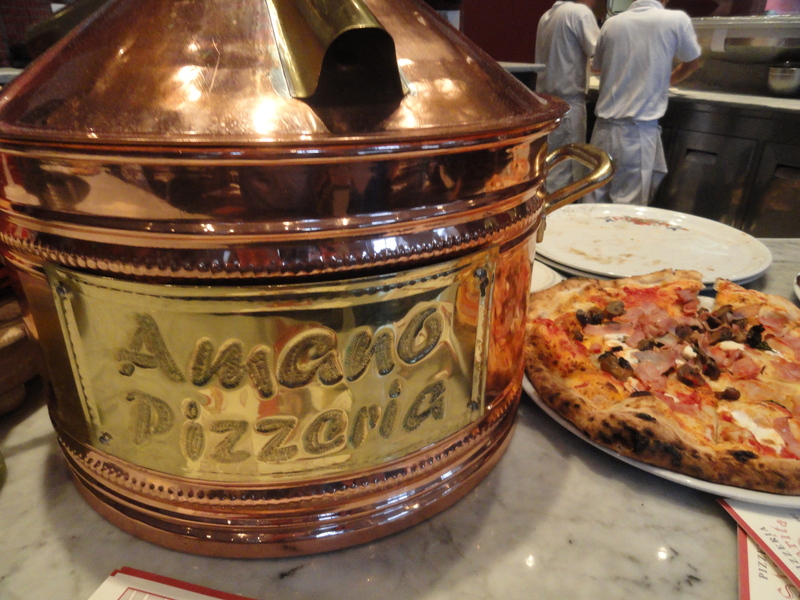 A Mano, a pizzeria/restaurant in Ridgwood, New Jersey announced that they would be hosting a pizza making demonstration with two of Naples’ greatest pizzaioli, Antonio Starita of Starita a Materdei in Naples, and Roberto Caporuscio of Keste in NYC. Roberto is from the Naples area and trained with Antonio in Naples. This was a demo I did not want to miss, so along with several friends, we reserved right away. On the day of the demo, over 150 people gathered at the restaurant. We found our friends, took our seats, and had just enough time for a glass of wine before the demo began. Both Roberto and Antonio were assisted by Adolfo Marletta of La Spaghetta in Naples. Roberto began by explaining how he makes his dough. 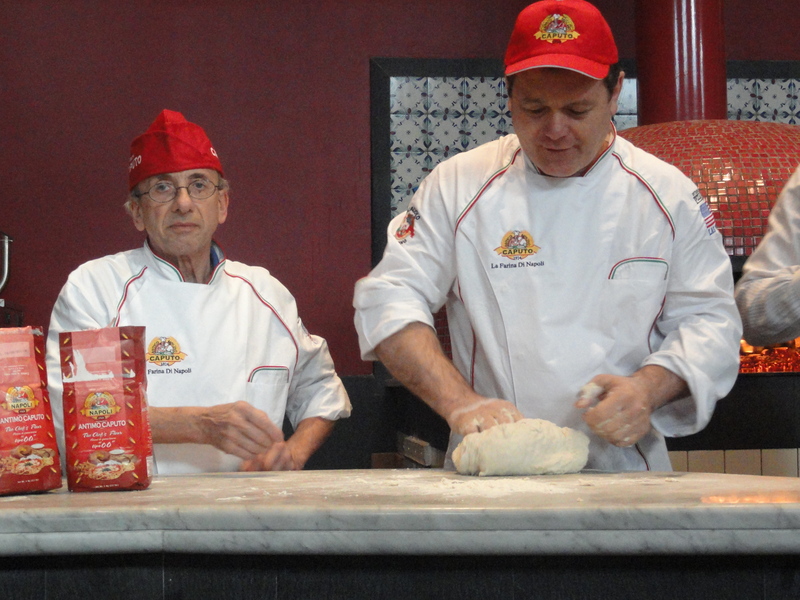 He said that the flour he prefers is a high quality one manufactured by Caputo in Naples. He uses only their “double zero” flour, which has less gluten in it so that it is easier to stretch. He uses a special type of mixer that kneads the dough gently. He demonstrated how to knead the dough by hand. Then he shaped it into little balls weighing about nine ounces for each pizza. He did this by holding it with one hand and with the other shaping it the same way one would when making mozzarella. 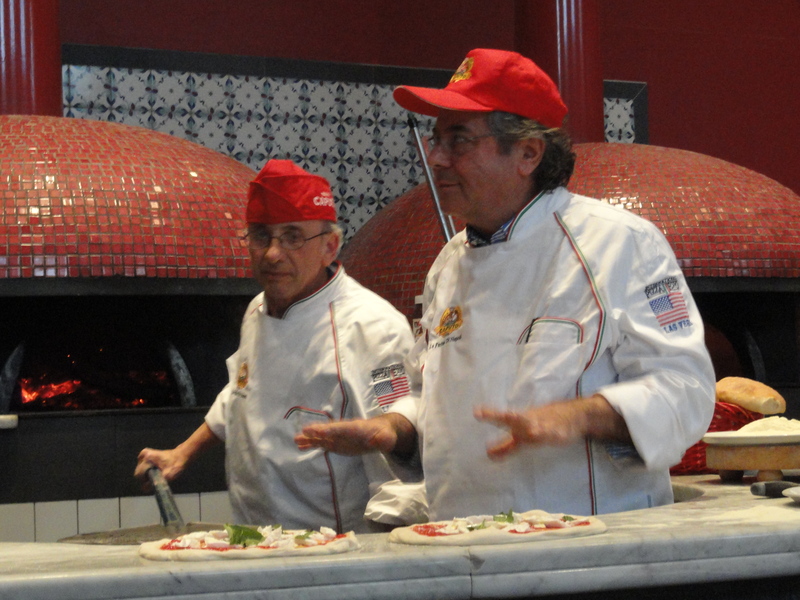 Antonio and Roberto mentioned that they had just returned from the Pizza Fair in Las Vegas. Someone in the audience asked who had won the pizza tossing event. Both men looked puzzled. Roberto said that they don’t toss the pizza in the air in Naples, while Antonio shook his head and with his hand made a slight back and forth movement saying very softly, mai (never). They explained that rough handling ruins the dough. Antonio then demonstrated how to shape the dough into a flat disk. He took a ball of dough and gently stretched it in four easy motions, rotating it and folding the edge toward the middle. Next he added pureed Italian canned tomatoes, mozzarella, and a touch of olive oil. After it was placed on the peel, he stretched the disk out so that it almost doubled in size. 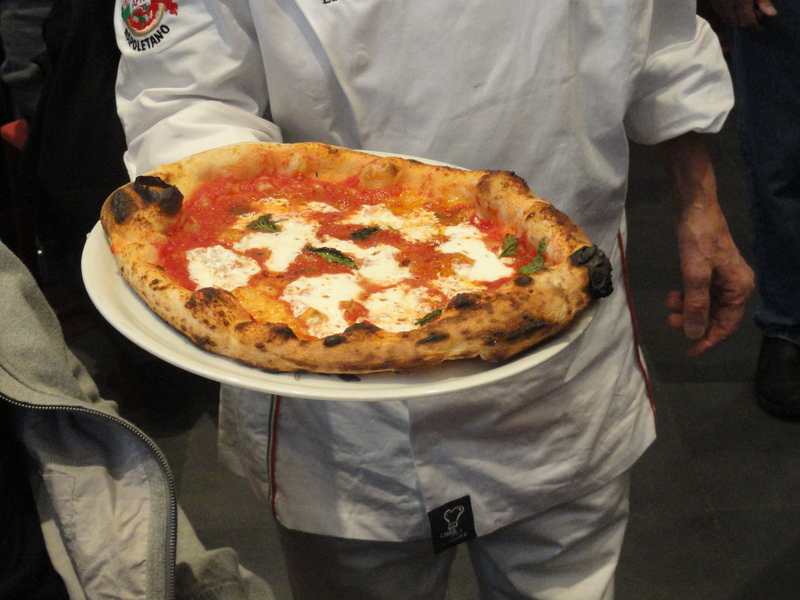 He quickly slid the pizza into the wood burning oven and about a minute or so later it was done. The result was perfect Neapolitan style Margarita pizza. Margarita is the queen of pizza, there is no king. I asked Antonio if he would make us his famous “lemon pizza”. 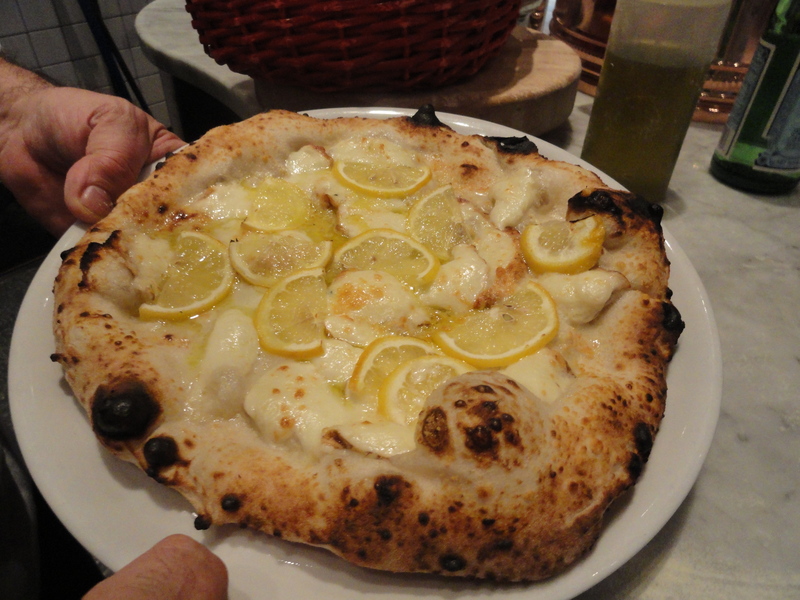 This pizza is topped with smoked provola (smoked bufala mozzarella) and thin slices of lemon. I had tasted this pizza once before, when Antonio had been at Keste. It was so good that I had to have it again. He was only too happy to do it. It was as good as I remembered it and went very well with the wine we were drinking. I then asked him to make another pizza of his choice. He made one of the best marinara pizzas that I have ever had. Roberto told us later that Antonio’s secret is to add a touch of pecorino cheese and a little oregano. 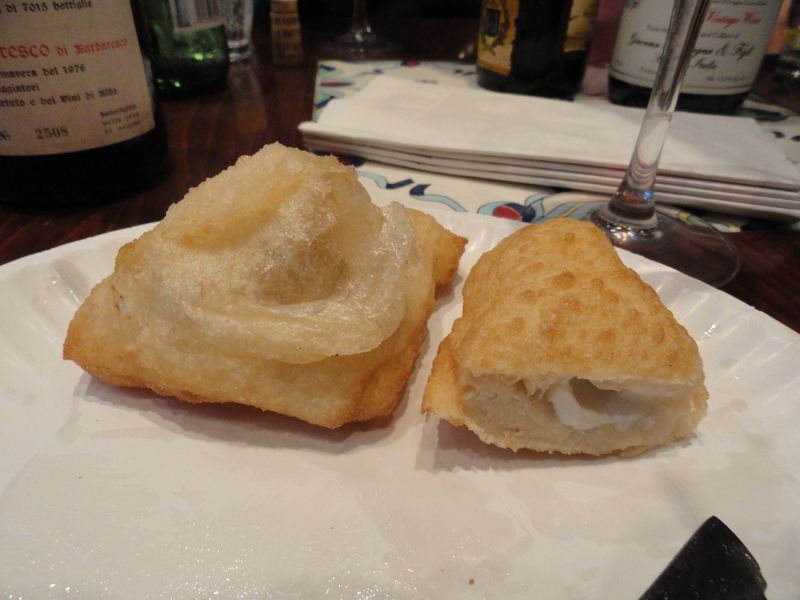 We also enjoyed the little fried calzone filled with ricotta. Most townships in NJ do not allow wine, beer or liquor to be sold in restaurants so we took advantage and brought the following wines. Barolo Riserva 1999 100% Nebbiolo Monchiero. This wine was ready to drink. I believe the 1999 was a vintage that can be drunk after 10 years. It had all the Nebbiolo characteristics and went very well with the food as did all the wine. Barbaresco 1967 Produttori del Barbaresco 100% Nebbiolo. This is one of the oldest co-ops in Italy and possible the best. This is also the oldest bottle I have tasted which was not a single vineyard. The label was not the same as the one they use today. This was everything that an old Barbaresco should be and more. Barolo Riserva 1967 Borgogno. This is a great wine. 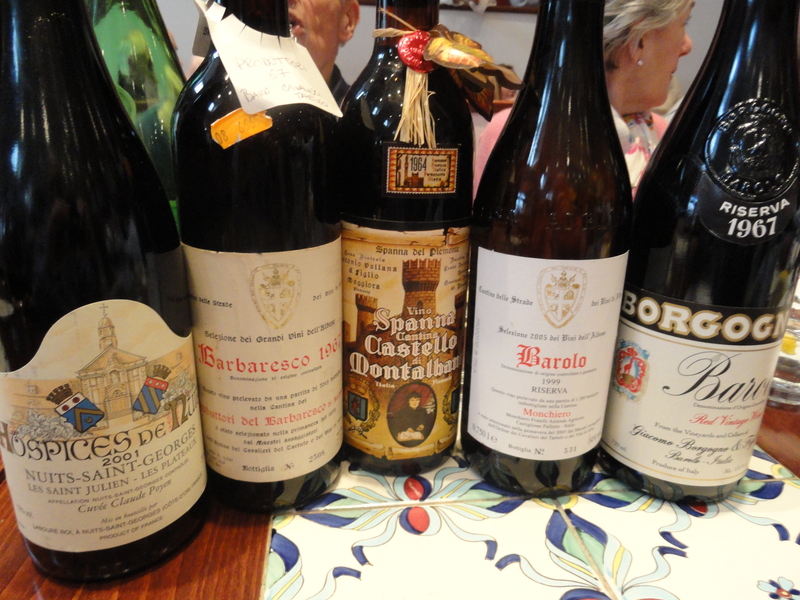 I have had many older bottles of Borgogno Barolo and they age very well. All those aromas that I love in old Barolo were there-faded roses, tar, tea, leather and mushroom. Burgundy 2001 Hospices de Nuits Laboure-Roi 100% Pinot Noir. This was the last wine and it did not disappoint as we sat sipping it and talking about the great pizza, great pizza makers (i pizzaioli) and Naples. It was a great evening at A Mano and I wanted to start making plans to go back to Naples and visit Starita a Materdei. In the meantime, since I live in NYC I will go to Keste when I want great pizza.